A while back, I shared a post about having a few dead and dying pine trees removed from our backyard. See full post here. I picked one of my stumps and got to work! 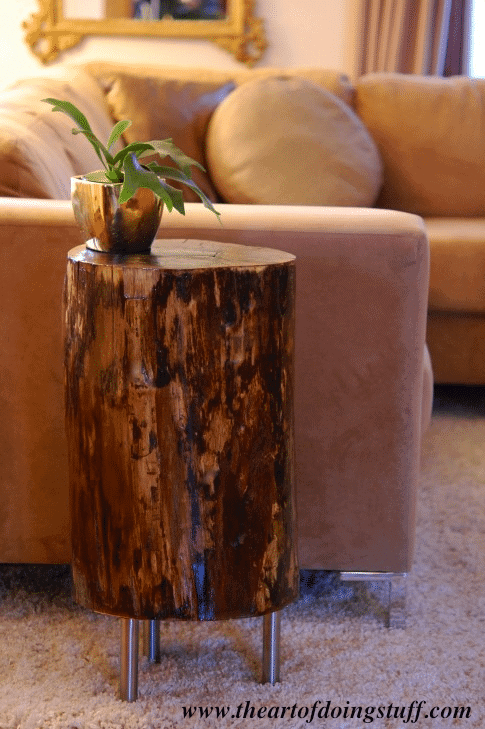 There are many tutorials on how to DIY a tree stump table…I followed some of the tips from Karen of The Art of Doing Stuff blog. Her step by step tutorial is excellent! Next step was to attach some legs. I found this set at Ikea, and they worked perfectly! And here it is! All styled and ready for sale at our shop Hip Chick Designs. I really like the way the white top and grayish sides have a beachy/coastal feel and look! I love the way it turned out! I think I will make a couple more like this. I also have plans to make a few on casters, and some smaller ones to be used in groupings. Luckily I have a pile of stumps to choose from right in my backyard! LOVE how you gave the log legs! I actually having a few logs in my garage waiting to be turned into tables! Thanks for linking up to Monday Funday! Beautiful! Those are going to sell so fast! Wow! So cute with the painted top!! I have a few of these waiting in my shed... my husband said they need to "cure" before peeling and bringing them inside... perhaps that was a bit of a story?? Anyhow, yours turned out amazingly! I love it!! We have tree stumps around our camp fire, but I'd better make some like your for inside the house. Wow, great idea! I will keep this in mind! I so love this table! Great job using what you have! how fun! i love this diy project too and enlisted my dad to help. he has a farm with lots of trees and has a stump waiting for me. only he says it will take 10 years to dry out. er, hope that's an exaggeration dad. i really like the look of the legs, though my waiting-for-me stump is 200 lbs. i'll have to some pretty substantial ones! I love that the tree is being reused in such a unique and creative way. We're removing a tree from our yard, and I'm half tempted to keep a few feet of the trunk. I would love to recreate your idea of the rolling tree trunk tables! Hi, Did the pickled white stain give the stump the grey tint ?